Remember the moment Nayakan Kamal turns gangster after shooting the area cop? Well Kabali seems to turn gangster the same way after shooting someone in hotel. Remember the retro Rajini scene in the teaser? Well it seems like he is coming out of a hotel after shooting someone as per the visuals in the song Veera Thuranthara. Gangster moment in Kabali. This page hosts a weekly slideshow related to Tamil movies. Each slide includes a picture and some description about that picture. All the slides will have a recurring theme. People looking for actress stills, actress images, actor stills, actor images, movie stills, movie images, and other interesting topics, relevant issues in Tamil cinema will find this page useful. 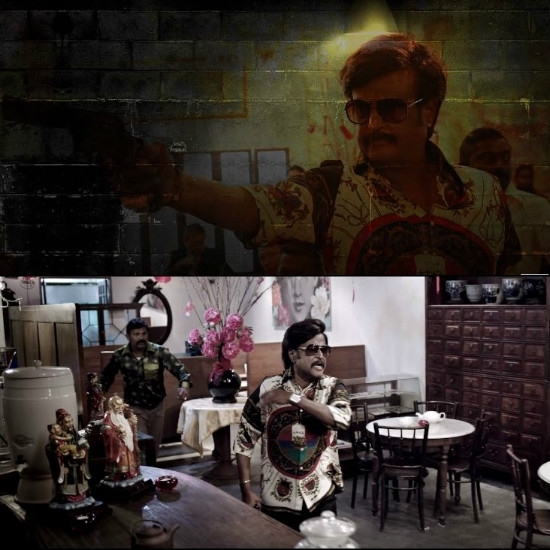 Kabali turns gangster Nayakan style | 9 things the Kabali album reveals about the plot.